The Dodge Journey is most affordable midsize SUV on the market and is actually the best selling Dodge so far this year. Most buyers find its size perfect for their needs as it’s smaller than many midsize SUVs yet packs three rows of seating. It’s thin on features and technology but its budget price reflects that. It delivers adequate performance, plenty of utility, and acceptable safety and reliability for nearly ten thousand less than a bulk of the segment. At first glance, the Journey seems to offer a lot of value. The Journey SE starts at just over 21,000 dollars, several thousand less than the rest of the midsize SUVs. Unfortunately, that’s with the four-cylinder engine that doesn’t deliver the necessary power. Upgrading to the V6 will push the price to over $25,000, where most of the competition begin and deliver more features for the money. If you can live with lethargic acceleration, the base model offers quite a bit if you’re looking for seating up to seven for compact SUV money. The Journey is available with either an anemic 173 horsepower or a 283 horsepower Pentastar V6. The first is mated to a rough shifting 4 speed automatic while the latter is paired with a six-speed automatic that’s only a bit more refined. Both earn 25 mpg highway ratings and a 19 mpg city and 17 mpg city rating, respectively. We’d recommend the V6 as the 4 cylinder really doesn’t supply sufficient power to motivate this SUV. Acceleration is acceptable in the V6, with a 7.8 zero to sixty time. In the 2.4 Liter, expect a time closer to ten seconds, which makes the Journey one of the slower midsize SUVs. 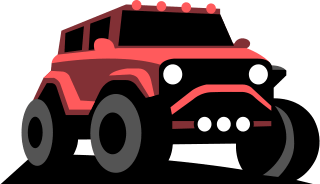 The unibody design and numerous suspension options augment the vehicle’s ride. It doesn’t handle like a sedan but rides much like the oversized station wagon that it is. Road imperfections are absorbed with ease though there’s a bit of body roll in corners. The brakes do a great job of stopping but there are some complaints that they lock up easily. Overall, the Journey delivers mediocre performance for the midsize segment. Without a doubt the Journey’s strong suit, the cabin is surprisingly refined for the SUV’s budget price. There are soft-touch materials wrapping the dash, center console, and doors. The seats are some of the most supportive around for the price and there are ample head and legroom in the first two rows. The available third row is best left to small children, standard for the segment. A high point of this interior design is the many creative storage compartments, like under the second-row floor and under the front passenger seat. We applaud these features that you won’t find in many other SUVs. The standard 4.3-inch Uconnect infotainment system is on the small side but benefits from superior software and response time. The 8.4 inch is available for less than a thousand more and we think it’s worth the extra wood. This system is well-received by owners and critics alike, featuring crisp graphics and one of the most user-friendly interfaces on the market. Other options include a premium Alpine audio system with subwoofer and rear seat entertainment system with infrared wireless headphones, one of the few available in budget-priced SUVs. A weakness of this interior is sound dampening, it’s probably the loudest in the segment. Lots of road and wind noise makes its way into the cabin, especially at higher speeds. Cargo capacity is strong for the segment, with up to 67 cubic feet with all the seats folded. Overall, the Journey provides an excellent blend of useful storage space, infotainment, and entertainment options. Receiving only slight changes since its introduction in 2009, the Journey is beginning to look pretty dated. It’s one of the few SUVs that lacks LED daytime running lamps and only offers LED tail lamps on higher trims. The Journey is a large SUV for the price, a midsize SUV that costs thousands less than many of its competitors. Though it resembles a station wagon more than a true midsize SUV, that’s not necessarily a bad thing. The lower stance enhances the handling and appearance. The front receives a more aggressive front fascia than years past, below the crosshair grille found in many Dodge models. The sides feature flared fenders and simple, straight lines. At the rear, a roof spoiler, optional dual exhaust tips, and optional “ring of fire” tail lights provide the Journey a modicum of attitude. The Blacktop Package furnishes many black details and black wheels that we think are worth the extra few hundred dollars. Despite the aging design, the Journey boasts a distinctive exterior that belies its budget price tag. The side curtain airbag failed to deploy, “leaving the dummy’s head vulnerable to contacts with side structure and outside objects.” Also, the headlamps are rated “POOR” and don’t provide sufficient visibility when driving at night. The Journey still isn’t available with the advanced collision prevention technology available in much of the competition and a rearview camera is only available as a costly option in all trims despite many midsize SUVs including this feature standard. 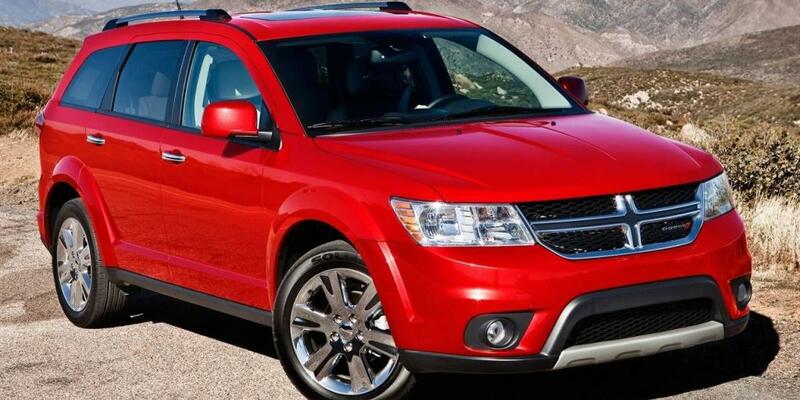 The Dodge Journey lags behind most of the midsize SUV segment in safety, acceptable at best. Perhaps one of the most accessible midsize SUVs is the Kia Sorento, which starts just over $25,000. Like the Journey, there’s a 2.4 Liter 4 cylinder standard and a V6 available as an option. An additional turbocharged 2 Liter 4 cylinder is another option on the Sorento. The KIA features a sophisticated design inside and out and ostensibly, looks and feels more luxurious than it costs. The cabin is much quieter in the KIA, a difference that’s noticeable from the moment you turn the Sorento’s ignition. You also get a large standard rearview camera which is only available as a costly option in the Dodge. The available UVO 7 or 8-inch infotainment system includes navigation, Apple CarPlay, and Android Auto. It’s not as good as the Uconnect 8.4 system that’s an option in the Journey. The Kia gets six more cubes of overall cargo capacity and identical numbers behind the second and third row. The Kia packs advanced safety features that aren’t available in the Dodge and receives higher safety and reliability ratings. We think that if you have the extra money, you should definitely go with the Sorento. Otherwise, Journey offers value for its price but makes less sense as you move of the trim levels. The Dodge Journey SE starts at $21,145 with a 2.4 Liter four-cylinder engine with dual variable valve timing that makes 173 horsepower and 166 lb-ft of torque. It’s mated to a 4-speed automatic transmission at this trim level. The Journey SE uses a fully independent suspension system with MacPherson struts in the front and a multilink suspension at the rear. On the outside, power heated mirrors are standard, as is Dodge’s trademark crosshair grille, sculpted fender flares, roof rails, and fog lamps. Inside there are tons of nooks and crannies to store small items, cargo area in-floor storage, in-floor cooler, and fold flat seats to provide up to 67 cubic feet of storage space. Standard safety equipment includes a protective frame, active front seat head restraints, seven advanced airbags, specially designed front and rear crumple zones, Brake Assist, and electronic brake force distribution. The $395 Blacktop Package provides 17-inch by 6.5-inch aluminum wheels, Black headlamp bezels, and a Gloss Black grille. The Flexible Seating Group adds a 50/50 fold-flat reclining third row, 3-zone temperature control air conditioning, and easy entry system for $1,995. The $795 Popular Equipment Group adds an interior observation mirror, leather-wrapped shift knob, leather-wrapped steering wheel, overhead console, passenger assist handles, and sun visors with illuminated vanity mirrors. The Chrome Accent Package by MOPAR costs $685 and installs Chrome body side molding, a Chrome exhaust tip, a Chrome fuel filler door, and Chrome mirror covers. The Connectivity Group equips a 4.3-inch touch screen display with SiriusXM, a remote USB port, and integrated audio jack. It costs $5,600 to upgrade to All Wheel Drive, which adds the 3.6 Liter V6 and Aisin six-speed automatic transmission as well. The Dodge Journey SXT starts at $25,045 and furnishes LED taillamps, a third row with additional airbags, a sliding and reclining second row, alloy wheels, UConnect voice command with Bluetooth, and a 4.3-inch touchscreen audio display. The 3.6 Liter V6 costs $1,700 and adds the 6-speed automatic transmission. Touring Suspension is available as well but requires the addition of the 3.6 Liter V6, Blacktop Package, or 17-inch aluminum wheels. The Blacktop Package costs $1,095 on this trim level and supplies 19 inch by 7 inch Gloss Black aluminum wheels with 225/55R19 BSW all-season touring tires, Black headlamp bezels, Gloss Black exterior mirrors, Gloss Black fascia applique, Gloss Black grille, and touring suspension. The $1,095 Premium Group adds an interior observation mirror, leather-wrapped shift knob, leather-wrapped steering wheel, power 4-way driver lumbar adjust, 6-way power driver seat, premium cloth low-back bucket seats, and security alarm. The Uconnect 8.4 Touch Screen Radio Group installs the 8.4-inch Uconnect system with integrated ParkView rear back up camera, SiriusXM, and ParkSense rear park assist system for $895. The Dodge Journey Crossroad is $26,995 and furnishes an overhead console with storage, universal remote transmitter, electrochromatic inside rearview mirror, leather and simulated alloy steering wheel, dual illuminating vanity mirrors, and 19 inch painted alloy wheels. The 3.6 Liter V6 is $1,700 and installs the 6-speed automatic transmission. The Uconnect 8.4 Touch Screen Radio Group furnishes the 8.4-inch Uconnect system with integrated ParkView rear back up camera, SiriusXM, and ParkSense rear park assist system for $795 on this trim. The Crossroad AWD starts at $30,495 and includes the V6, 6-speed transmission, and touring suspension. The GT trim adds the V6 with six-speed automatic transmission and flex fuel capability, high-performance suspension system, remote anti-theft alarm system, heated steering wheel, leather seating trim, multi-level front seat heaters, front one-touch power windows, and Alpine premium audio with subwoofer. The $395 Blacktop Package adds 19 inch by 7 inch Gloss Black aluminum wheels, Black side roof rails, Gloss Black exterior mirrors, Gloss Black grille, and Gloss Black fascia applique. The $695 Driver Convenience Group installs the ParkSense rear park assist system, ParkView rear back up camera, and universal garage door opener. The Rear Seat Video Group I adds a second-row overhead 9-inch video screen with video remote control and IR wireless headphones for $949 on this trim level. The Family Entertainment Group installs the Rear Seat Video Group 1 and second-row seat with 2 child boosters. The Navigation and Back-Up Camera Group furnishes the 8.4 Uconnect system with Garmin navigation, SiriusXM Travel Link, SiriusXM Traffic, ParkSense rear park assist system, and ParkView rear back up camera for $1,295. All Wheel Drive costs an extra $1,900.